Rose hips, also called haws, are the bright red, vase-shaped fruit of roses often used for medicinal purposes by alternative health practitioners. Rose hips are rarely allowed to develop on modern roses, although they're abundant on wild rose species. The easiest time to spot them is when the flower petals fall in late summer. Oil from rose plants should not be taken internally unless your medical practitioner instructs you to do so, since side effects can occur. Rose hips can be eaten after the seeds and hairs are removed, but are more often dried and made into teas. Oils extracted from the petals or seeds of the plant are also used in aromatherapy or for topical use. It takes around one ton of petals to make 1/2 pint of oil, according to UW Farm, produced by the University of Washington. Rose hip preparations may have anti-inflammatory and anti-oxidative effects, according to a June 2008 article published by German researchers from the University of Freiburg in the 2008 issue of "Phytotherapy Research." Rose hips contain large amounts of vitamin C, almost 50 times as much as lemons, UW Farm explains. Rosehip seed oil made from a Chilean plant, Rosa rubiginosa, is used topically for skin treatments such as to prevent scar formation, treat acne scars and reduce skin-aging damage such as sun spots and wrinkles. Rosehip seed oil contains fatty acids that may benefit the skin, according to Mountain Rose Herbs. However, more clinical studies into the potential benefits are needed before topical uses for rosehip seed oil can be established, the University of Freiburg researchers cautioned. If taken internally, rose hip oils can also diarrhea, nausea, vomiting and abdominal discomfort. Drink two glasses of water and then seek medical attention if you ingest rose hip oils, the Occupational Safety and Health Administration Material Safety Data Sheet states. If you get rose hip oils in your eyes, wash the eye thoroughly with plain water for 15 minutes and seek medical attention if redness occurs. Allergic reactions to the oil can also occur. 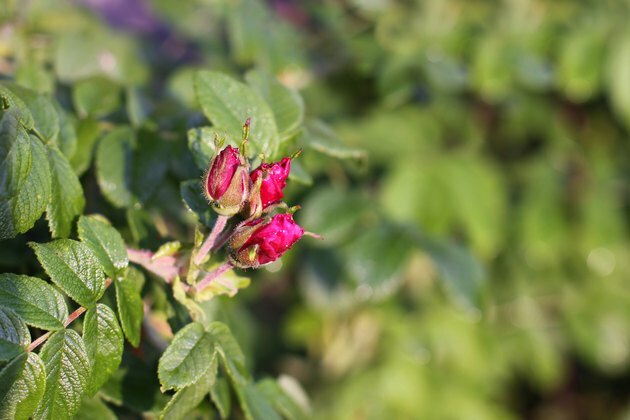 Rose hip products obtained from pesticide-treated shrubs should never be ingested or used for medicinal purposes, Dr. Leonard Perry of the University of Vermont warns. The oil should not be used on acne or on very oily skin. Refrigerate rose hip oils to maintain potency and prevent breakdown. What Are the Benefits of Rose Hip Oil on the Face?